Broccoli is a favorite vegetable for many but this Broccolini With Chipotle Drizzle is almost like eating junk food – you just can’t get enough. The good news? It is good for you, it is quick and it is simple to prepare. All you need is plenty of baby broccoli, a few basic ingredients, and of course, our Glory Kitchen San Miguel nut & spice mix. I have to admit I had this Broccolini with Chipotle Drizzle as my entire meal because it was just so delicious I did not want to bother with anything else. If only I had added some shredded chicken on top it could have sufficed as a complete meal. I’ve heard this called both broccolini and baby broccoli. It is a relatively new natural hybrid of the old standby of basic broccoli. Hybrid, as opposed to genetically modified, and created by a Japanese company in California in the early 1990’s. Broccolini has smaller, looser florets and longer, thinner stalks than typical broccoli. Overall, the stalks are more tender and I believe, tastier when cooked. I always cook broccolini in its entirety – florets, stalks, leaves and all. The only thing I do to prepare it after washing and drying, is to slice off the ends to expose the fresh stalk. Once you do this, you are ready to cook. This has become one of my very favorite vegetables as of late and I enjoy interchanging the recipe with a variety of our Glory Kitchen nut mixes. After trying it with the San Miguel, try making it again and altering the nut blend – the Cairo, Mumbai, Penang, Umbria or Provence blends would all be wonderful used in a similar way (just remove the chipotle and paprika from the recipe). And as a side note, if you are not one to handle spicy sauces, you may want to reduce the amount of ground chipotle added to the sauce, or you could always leave it out altogether. Don’t leave out the paprika, however, it adds nice color to your drizzle. Hope you enjoy as much as I did. Set the oven to 450°. Whisk together the ingredients for the chipotle drizzle. Taste for flavor and add additional ingredients, such as more heat from the chipotle, as preferred. Set aside. After washing and drying the broccolini, cut a bit of the ends, place it on a foil lined baking sheet and drizzle with a bit of olive oil, a sprinkle of sea salt, and a sprinkle of San Miguel nut & spice mix. I do not remove any of the leaves but instead roast the stalk in its entirety. Using your hands, work the olive oil and seasonings into the baby broccoli so it is lightly coated. Spread the broccolini out onto the baking sheet so the stalks are not crowding each other and place into the hot oven for about 10 minutes. Be careful not to let them burn, but you do want some of the tips browned - this adds to the flavor. Remove from the oven, allow to cool a bit and place them on a serving platter. 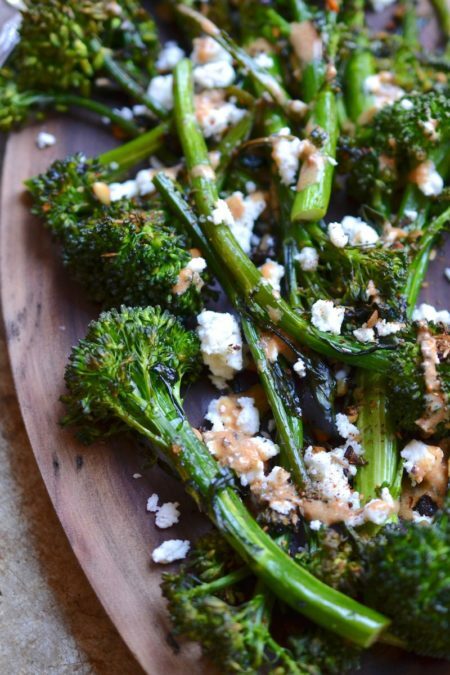 Drizzle the broccolini with a bit of the chipotle sauce, sprinkle all over with queso fresco, and add a bit more sprinkling of the San Miguel nut & spice mix. These can be served warm but I often will serve the broccoli at room temperature along with a simple entrée such as grilled fish or chicken.